Meeting an elephant for the first time can be a little scary. Just watch this corgi's reaction. Who doesn't love Winnie the Pooh? This might just be the most adorable Pooh I've ever seen. Mini pumpkins are always up to no good. Don't believe me? This little pup does — just watch this! We all had at least one costume that our parents put us in that we hated. This doggo is no exception. This owner taught his dog to fetch his missing "leg". So cute! Watch this video and see what the dog comes back with. I am pretty sure this dog was made for this costume. See for yourself! It suits her to a T.
Ride em' Cowboy! 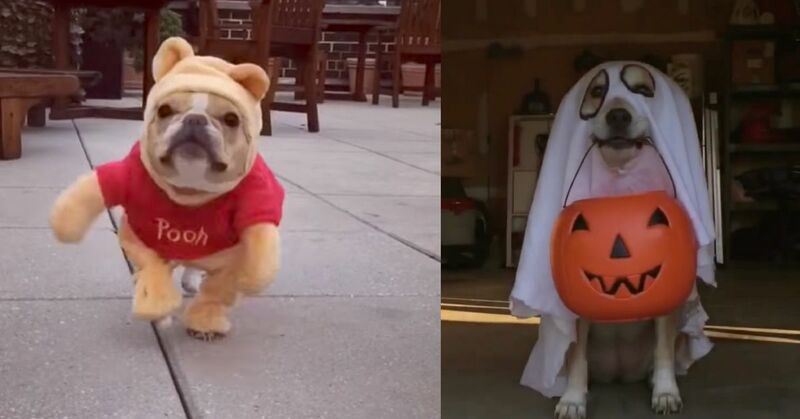 After watching this, I want to find this costume for my dog. Man down! LOL. Seriously, this one is the best. Just look at this little football player. Next year, I am letting my doggo do all the trick-or-treating for me. This dog has the right idea.